The majority of hair regrowth methods focus on topicals and supplement formulas, such as Rogaine and Propecia. These may help temporarily, but at what cost? Both products are associated with significant and possibly irreversible side-effects. And while natural ingredients and supplements exist, there are other natural ways that might indirectly improve the quality of your hair. One such method is yoga, an ancient practice with many proven health benefits (1). In this article, I’m going to show you the 4 main ways that yoga could help improve your hair health. Does this mean that if you do yoga you’ll never go bald? No of course not. There are many yoga teachers with thinning and receding hairlines so clearly yoga isn’t a cure. There are many factors that contribute to the overall growth or loss of hair. My point with this article is to explore possible reasons that yoga might positively impact your hair in a holistic way. How Can Yoga Help with Hair Growth? There are various factors that contribute to thinning and balding, and which can also impact hair growth (or lack thereof). These include genetics, environment, health and wellness, and diet. More specific triggers, which fall into various categories above, include scalp tension, stress, poor oxygen intake, and poor blood flow. Let’s look more closely at these triggers, and how yoga may help to mitigate them. Tension is a physical stress response, which is often triggered by muscle contraction and central sensitisation (2). The same can be said of scalp tension, which is believed to play a role in hair loss (3). 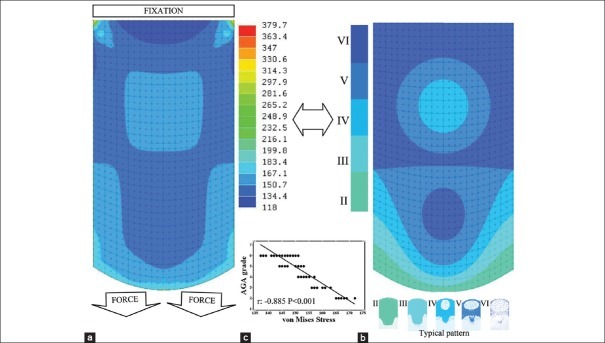 As you can see from the diagram below, the areas of highest scalp tension correlated strongly with the areas of hair loss typically experienced by those with ‘pattern’ baldness. This isn’t a coincidence. Scalp tension restricts blood flow and leads to hair follicle miniaturisation as you’ll learn about more in this article. Yoga has been shown to reduce tension, and even relieve pain in various parts of the body (4, 5). When combined with other tension-reducing techniques, including scalp massage, yoga can contribute to reduction in scalp tension which can benefit hair growth (3). At the top of the scalp the tension is highest, and at the sides and back, the downwards tension is minimal. This is why hair loss follows a predictable pattern. Reducing tension that comes from the neck, shoulders and lower back is a very good way to start reducing tension that connects up to the scalp. 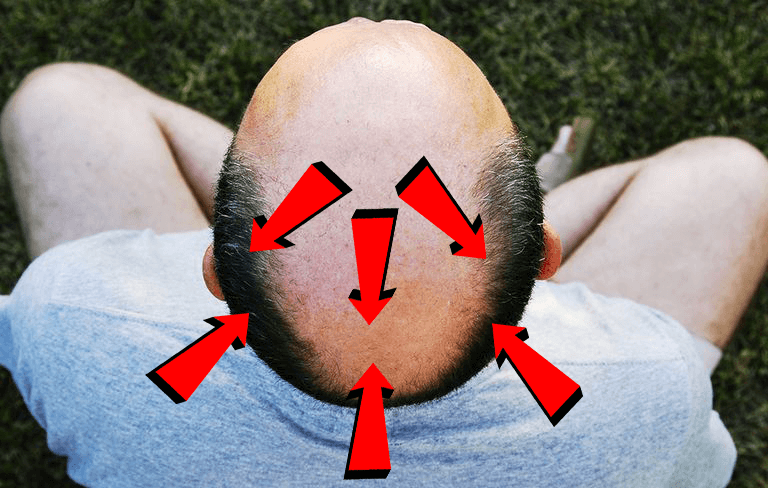 As you can probably imagine, if you have extremely tense neck and shoulders then reducing the tension running up to your scalp will be much harder and the chances of regrowing even a small amount of hair are small. This video above takes you through some useful postures to reduce tension from the neck and shoulders. I believe one of the reasons that a sedentary lifestyle correlates quite strongly with the rates of hair loss per capita is because sitting can really make neck and shoulder tension much worse. This leads to tension moving up the neck and into the scalp. Scalp tension isn’t the only kind of tension that yoga can help to release. In fact, research shows that performing yoga regularly can reduce stress levels (5). But what does this have to do with hair loss? Stress has long been believed to trigger changes throughout the body (6). These are a result of the systemic stress response, which triggers both general and local biological responses (7). As the hair follicle is an organ, it’s not immune to such changes (7). In fact, a pilot study performed in 2017 even showed how such changes can impact hair growth in women undergoing an exam period (8). There are many ways to mediate these effects, but yoga has been proven time and again to be an effective method. According to researchers, “the practice of yoga produces a physiological state opposite to that of the flight-or-fight stress response” (9). This helps to create a sense of balance, which improves overall mental and physical health when practiced regularly. A benefit of yoga that many people take for granted is its positive effects on respiratory regulation (10). In other words, it helps to control breathing patterns so as to improve oxygen levels and reduce Carbon Dioxide (CO2) retention. And while oxygen intake may be decreased, you may be surprised to learn that oxygen delivery throughout the body can increase. How’s that? Yoga has been shown to increase blood flow, while also increasing levels of hemoglobin and Red Blood Cells (RBCs) (1). Both hemoglobin and RBCs aid in the delivery of oxygen throughout the body. This means that oxygen delivery will improve, and even non-vital organs (such as the hair follicles) will receive the necessary oxygen levels to survive. As mentioned above, yoga can increase blood flow and improve oxygen delivery (1). However, oxygen isn’t the only critical component delivered via the blood. Nutrients, including iron, niacin, and zinc, play a crucial role in hair health and growth (11, 12, 13). (Learn more about the health benefits of niacin and zinc). While nutrient deficiencies are rare in developed countries, they can be present due to underlying medical conditions. However, even people who receive proper nutrient levels in their diet may experience nutrient-related hair loss. Why? 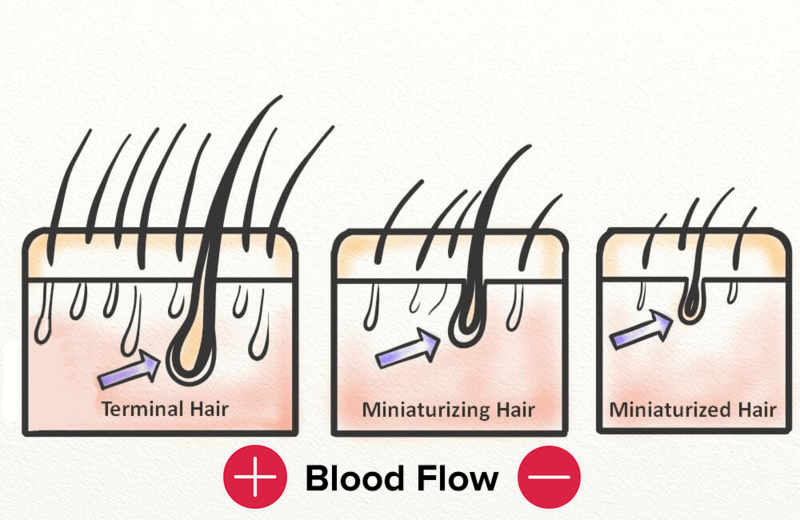 Because when blood is unable to make its way to the follicles, nutrient delivery is significantly decreased. With less nutrients delivered to the hair bulb, the less hair growth that can occur. By increasing blood flow to the scalp, yoga can improve nutrient delivery. This can strengthen the hair bulb and strands, which contribute to improved growth. 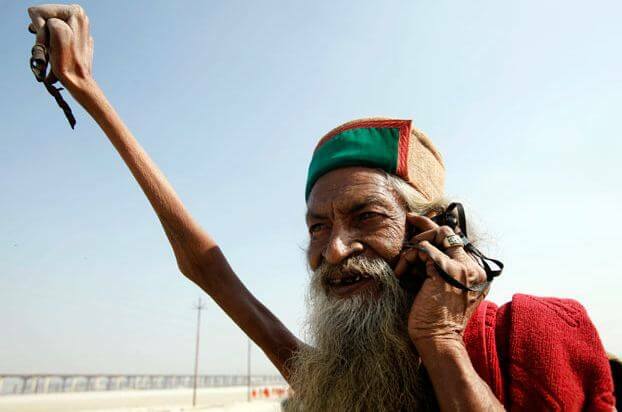 Amar Bharati is an Indian man who held his arm above his head for many years. As you can see, due to the reduced blood flow the arm got significantly smaller. The same happens with our hair follicles, lack of blood leads to hair follicle miniaturization and eventually they stop growing at all and fall out. The three positions below have one major thing in common – they focus on increasing blood flow to the scalp, which is done naturally with the help of gravity. To begin, stand with your feet about six inches apart. Take a deep breath, and upon exhale bend forward at the hips and bring your torso and head as close to your legs as possible. While doing so, keep your legs completely straight. Grasp your big toes, using your thumbs, index, and middle fingers. Keep your back as straight as possible. Get into a pattern of breathing and upon inhalation, round out your torso and straighten your elbows as if you were going to stand. 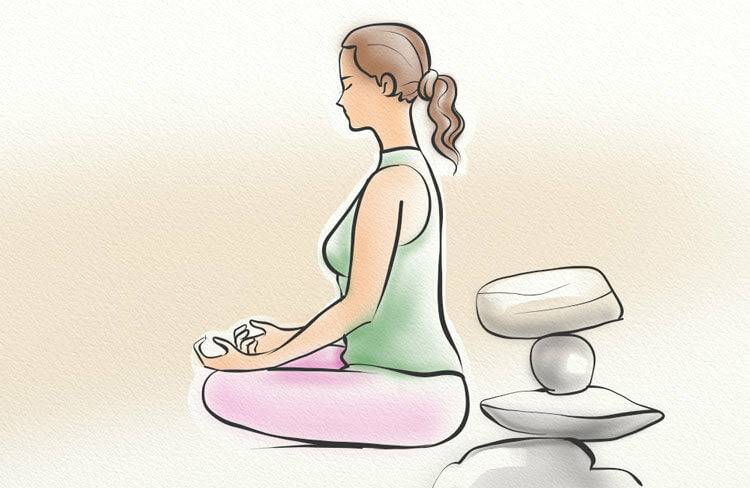 Upon exhalation, lift your sitting bones (14). Next lift the top of your sternum as high as possible, but without compressing the back of your neck. Continue to lift your torso upon inhalation, and lift your sitting bones upon exhalation. Now exhale, loosen your elbows, and pull up on your toes while lengthening your torso. Hold for a moment, and then upon inhalation release your grip on your toes. Bring your hands to your hips, and swing your torso and head up in a singular movement until you’re in full standing position. Lower yourself to the floor and onto your hands and knees, with your knees just below your hips and your hands slightly ahead of your shoulders and facing forward with index fingers parallel. Set a breathing pattern, and upon your fifth or sixth exhale, lift your knees away from the floor while keeping them slightly bent and the heels lifted from the floor. Lengthen your tailbone, and lift your sitting bones towards the ceiling. Once you’re situated, push your thighs back and bring your heels to the floor upon exhalation. Straighten your knees without locking. Next press your index fingers into the floor, and lift using your arms from your wrists to your shoulders. Press your shoulder blades firmly and towards your tailbone. Remain in this final position for one to three minutes, and then slowly bend your knees to the floor upon exhalation. Relax into child’s pose, as you rest your sitting bones onto your calves and ankles and lengthen your back. 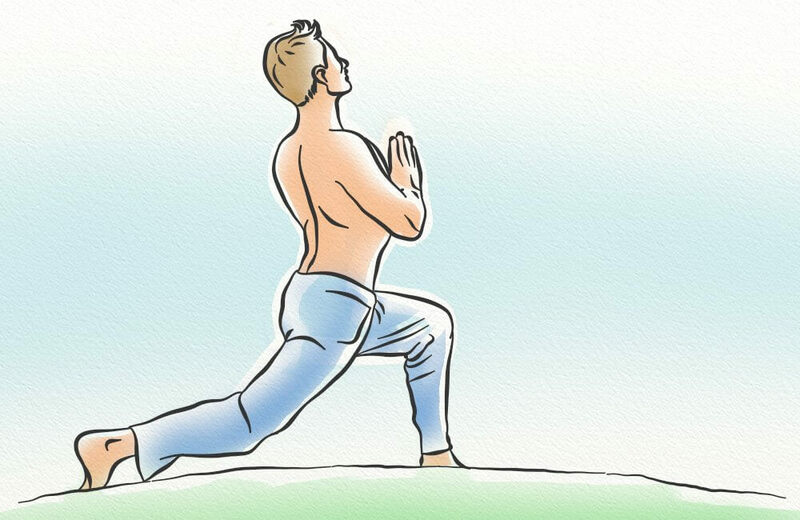 Begin in mountain pose, with your legs straight (knees not locked), your feet six inches apart, and your arms placed firmly at your sides. Find a comfortable breathing pattern and on your fifth or sixth inhalation, lift your arms high above your head while lengthening your legs and torso, and then fold forward at the hips. Place your arms on the outsides of your shins, or the outsides of your feet. Spread your toes, and be sure to press down firmly through each toe and through the heels. This will engage the thigh muscles. Begin to shift your weight forward, until your hips have passed over the heels of your feet. Relax your spine, neck, and head. As you breathe, do so by filling your diaphragm completely, and be sure to relax on each exhalation. Hold this pose for one to three minutes, and then lift at the hips until you’re back in mountain pose. Yoga is a gentle, low-impact exercise that can be modified for almost anyone. However, you should be aware of your limitations to avoid causing harm. If you have any injuries, particularly of the neck or back, it’s best to speak with your doctor before beginning practice. You may also benefit from the help of a physical therapist, or a trained yoga instructor. Yoga poses, while they may induce feelings of stretching, should not be painful. Is yoga the answer to your hair loss woes? Not likely. However, it can offer numerous benefits that can help to slow (or stop) shedding and perhaps even promote regrowth. Of course, its other health benefits aren’t to be forgotten. Yoga is a great way to reduce physical and mental stress, while also improving oxygen delivery and increasing blood flow (1). These can contribute to pain relief, reductions in stress and depression, and improvements in cardiorespiratory performance just to name a few (15, 16, 17, 18). Adding a yoga class to your weekly hair care regime certainly wouldn’t be a bad idea, especially if you believe that stress has played a role in your hair loss.